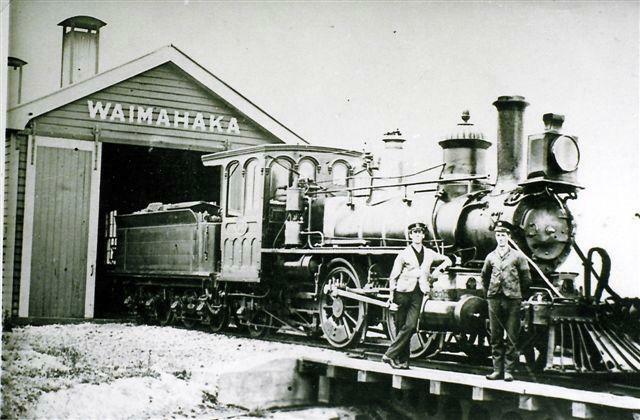 One day long ago, on an early February day of the year 1878, a crowd was gathered on the wharf in colonial Lyttelton to witness the arrival of the first two locomotives imported from America. Everyone assembled there that day gazed with awe at those brass bound little engines. All were impressed by the sight. The locomotives looked most peculiar; after all, to have the spokes of the driving wheels painted a rich gilt colour, and the tires painted purple; to have a sand dome cover of fluted iron, painted four different colour's, (red, blue, green and yellow), was something most unusual, to say the least! The sailing barque Auguste Friedrich arrived in Lyttelton Harbour on the 6th February 1878, with the first two of these engines from the land of the star-bangled banner. These two were: K87 and K88; both named after gallant American presidents - Lincoln for the former and Washington for the later. These two locomotives were built in late 1877 by the ROGERS LOCOMOTIVE & MACHINE WORKS, at Paterson, New Jersey, USA. The founder of the Rogers Locomotive Works was a man named Thomas Rogers. An American locomotive engineer (born 1792, died 1856 at 64 years of age), he established the Works in 1837, The proportions and construction of the American locomotives was visibly improved between 1849 and 1855 by this Thomas Rogers, then at the head of the firm of Rogers, Ketchum, and Grosvenor, of Paterson, New Jersey. Mr. Rogers was not an inventor, but, as a constructing engineer, he was the first to give the authority of a large and successful practice to many of the best features of the American Steam locomotive of later years. He increased the former allowance of heating surface, by introducing the "Wagon-top", or tapered boiler to supply a greater steam space across the crown sheet or fire box top, (this became a well known feature of early American locomotives), and presented the link motion, (the valve gear), to America in 1849 with steam passages of large size, and with 4 1/4 inches to 5 inches maximum travel of the valves. Giving the preference to the outside-cylinder engine, he was among the very first in America to properly counterweight the reciprocating as well as the revolving parts, and he placed the cylinders in a nearly horizontal position, at the same time spreading the truck wheels widely apart. He strengthened the fastenings of the cylinders and otherwise made the then favorite type superior to the inside-cylinder engines then in use in the States. In its general form, as well as in many points of detail, the Rogers engine has long been closely copied by most American makers. Mr. Rogers former business was continued by his sons, under the engineering direction of Mr. William S. Hudson, his Superintendent, once a pupil of George Stephenson's. It may be added, that, while driving wheels as large as 6 feet only came to be generally employed in American practice subsequently to 1851, from which time Mr. Rogers made many of that size, the general preference in the States returned by 1871 to 5 1/2 feet, and even 5 foot wheel diameter were thought sufficiently large enough for the greater portion of the passenger traffic on American railways. Mr. William S. Hudson was the man who designed the 2-4-2 wheel arrangement - hence the term "Hudson Double-Enders." The machine works Thomas Rogers began was to produce about 6,000 engines, before being taken over by the American Locomotive Company (ALCO) upon his death in 1856. The idea for a passenger 2-4-2 express locomotive was born in 1877; conceived by then acting Locomotive Superintendent of the New Zealand Railways at Christchurch, Allison Smith. In rank, he was under Mr. William Conyers, the Commissioner of Railways in the South Island. This man, Allison Smith, had high hopes. He believed that American locomotives were far superior to their British counterparts. The locomotives he had in mind had bar framed chassis, the bar framed engines being more flexible than the plate framed English built J's of 1874. Although perhaps not truly recognized in Allison's day as a valuable aid, bar frames played a major part in later locomotive design. Allison Smith was born in Jamaica on the 11th January 1854, was educated as a mechanical engineer at the Cowlairs Works of the North British Railway of Scotland, and had family ties across the Atlantic Ocean, thus becoming acquainted with American practice. These new locomotives were much different to the more conventional engine design. In 1854 Mr. Zerah Colburn was an engineer at the New Jersey Locomotive Works, and of the typical American steam locomotive, stated that: "....In addition to the bogie and cast iron chilled wheels, the framing constructed of forged bars is conspicuous, forming a strong contrast to the slab frame of English engines...." That was why Allison Smith held such high ideals; which when one considers the prevalent type of locomotive and the condition of those early railways, you can see that a change was necessary. 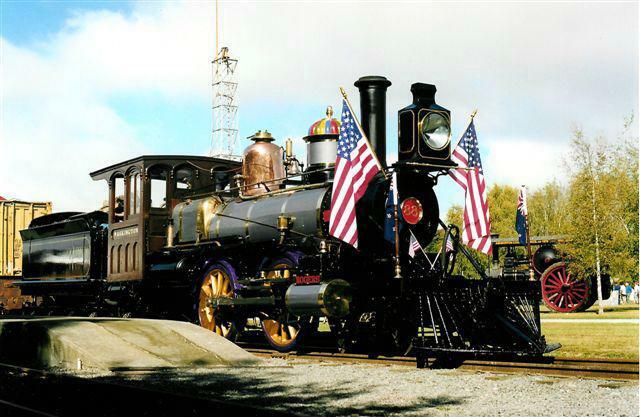 As you may already know, we have here in New Zealand a very old American locomotive built by the Rogers Locomotive and Machine Works at Paterson, New Jersey, named K88 "Washington". This engine was sent out to New Zealand back in 1878, and was the first through express train to run between Christchurch and Dunedin of the same year. K88 has a strange history. After running for years as an express, she was discharged to lesser duty's on branch lines. K88 made a name for herself by being the forerunner of the historic Kingston Flyer. Finally she was written off and dumped in a Southland river as stop bank protection in 1927. In 1974 she was hauled out of her muddy grave and eventually restored to running order using a boiler she had been fitted with back in 1903. After restoration and recommissioning in 1982 she ran at the Plains Museum at Ashburton until her boiler failed to pass for a new certificate in 1987. K88 was given up for a number of years as a hopeless case, until 1998 when a new all-welded boiler was built. At last the future was looking good. A new tender tank was built among other important items.. There has been a lot of salvage work going on in rivers to get parts for K88, and she was recommissioned again at Easter 2002. Today K88 looks and runs just as she did back in 1878 - even the 'bright' colour's are the same! Very few Rogers locomotives still exist in running condition in America, making this locomotive something unique. We have spent a number of years filming this second restoration. researching information, collecting old photos, and hunting down movie film of earlier days.